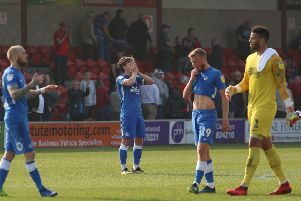 Conor Washington believes he can be the 20-goal-a-season player capable of firing Peterborough United to promotion. The 22 year-old striker has impressed with his form in the last two Posh matches. He scored his seventh goal of the campaign in the recent 2-1 League One defeat at Port Vale. He’s now completed one year at Posh during which he’s scored 12 goals, but he reckons he can improve on that ratio in the next few months. Washington is expected to start Saturday’s League One clash against Yeovil at the ABAX Stadium up front alongside Kyle Vassell. The pair started last weekend’s much-needed 2-1 win at Notts County last Saturday. “The manager wants a 20-goal striker and I can be that man,” Washington announced. “In fact all the strikers believe they will score goals and that’s good for the club. “It’s obviously far easier for the forwards when the team is playing well as more chances will be created. “And now that we’ve stopped the bad run with a win last weekend hopefully we will build on that and get back into the mix for the play-offs. “It’s been a tough season so far for me as the manager has tried different combinations up front, but hopefully I’ve now done enough to get a run in the side. “If we show the same desire we showed at County against Yeovil we will have a great chance of another win. Any transfer window business involving Posh looks set to be completed at the last minute. Permanent transfers must be completed by 11pm on Monday, February 2, although loans are permitted again a week later. Posh boss Darren Ferguson has confirmed he is seeking two new players, believed to be a central defender and a striker. On-loan forward Aaron Mclean returned to Bradford City earlier this week, while the expected loan signing of Leyton Orient central defender Mathieu Baudry collapsed over the weekend. Posh are hopeful highly-paid striker Tyrone Barnett will leave before the transfer deadline. League Two side Oxford United have agreed a fee with Posh, but Barnett is understood to be stalling over the personal terms on offer.